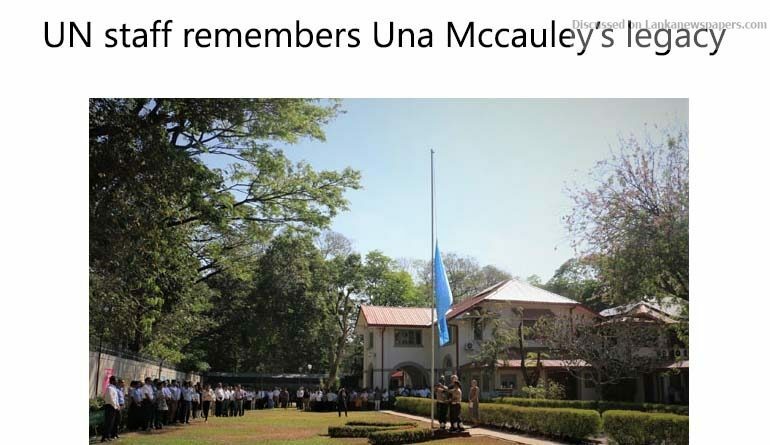 The members of the United Nations staff in Sri Lanka came together to observe a moment of silence in remembrance of the life and legacy of Late UN Resident Coordinator and UNDP Resident Representative in Sri Lanka, Ms. Una McCauley. Ms. McCauley passed away on Friday night, while on medical leave, undergoing treatment. Her untimely demise has been a shock to the UN Family, who dearly miss her charismatic leadership and friendship. The funeral service is planned to take place this Friday in Colombo. The remains will lie at the Jayaratne Parlour, Bauddhaloka Mawatha, Colombo 8 from 1.30 p.m. – 3.30 p.m. The cremation will be at 4.00 p.m. at the Borella Cemetery.